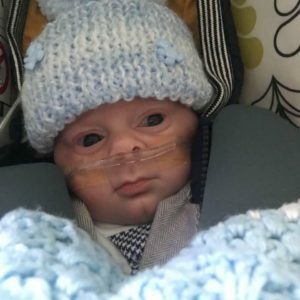 A grateful auntie and uncle have embarked on a selfless running challenge to raise money for Liverpool Women’s Hospital after their staff saved their severally premature nephew. Paul Eddy and Ruth Eardley of Orrell Park, wanted to show their gratitude for the hospital Neonatal Unit’s hard work over the 16 weeks that baby Noah was clinging to life in their care. 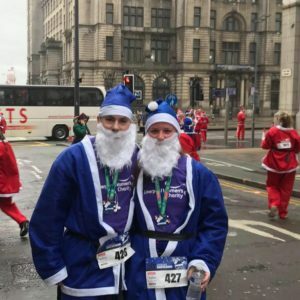 Having completed one out of their five planned runs so far at the annual Santa Dash last weekend, their JustGiving page shows they are already 65% on the way to reaching their £1,500 target as they continue to receive tremendous support from the community. Noah’s auntie Ruth, 27, told JMU Journalism how parents, Emma and Paul Gleeson, were met with devastating news when Noah was born at just 24 weeks into the pregnancy. She said: “When Noah was born they were told to say their goodbyes to him. They quickly arranged to have him baptised as they were told his chances of survival were extremely slim. Paul, 29, told JMU Journalism how Noah battled through to doctors’ amazement, miraculously coming home on his due date to spend Christmas with his family. He said: “He is a miracle baby, he has shown tremendous spirit and fought everything thrown his way thanks to the dedication of the doctors and nurses at Liverpool Women’s Hospital. Without them Noah wouldn’t be here today. “During Noah’s time in hospital the whole family were extremely worried but we all stuck together to support Emma and Paul. They went through many highs and lows during the 111 days Noah was in the hospital, but got through it now have him home. The upcoming runs Ruth and Paul are taking part are the Chester 10k run in March, the Coast Half Marathon in April, the Liverpool Rock ‘n’ Roll Marathon in May and the Aintree 5k Colour Run in July. To find out more information or donate to their cause, visit here.